Forklift Certification Colorado, Get Employees Certified in 1 Hour! Known as both the Centennial State and the Rocky Mountain State, Colorado has a diverse landscape. There are regions with arid deserts, grass-covered plains and prairies, river canyons and lakes, the snow-capped Rocky Mountains and more than 24 million acres of forest-covered land. Colorado is home to Rocky Mountain National Park, along with several other national and state parks and recreational areas that add to the state’s overall appeal. Colorado has an abundance of natural resources, including the world’s largest shale oil deposits, which are estimated to contain more than one trillion barrels. For outdoor enthusiasts, there are lots of opportunities for camping, cycling, hiking, fishing, hunting, rock climbing – the choices are almost limitless! In short, Colorado is a great place to live and work. Colorado has one of the fastest growing populations of any state. The state also boasts a vibrant and varied economic base that includes manufacturing, mining, technology and telecommunications businesses and many others. Colorado’s economy continues to outpace the nation’s other states in terms of productivity and GDP. From terminals and distribution centers to manufacturing facilities and warehouses, there’s always plenty of demand by Colorado companies for certified forklift drivers to store, manage and move their products. The U.S. Occupational Safety & Health Administration (OSHA) requires business owners to provide their workers with formal forklift training and certification, which is where ForkliftCertification.com can help Colorado businesses become OSHA compliant. FLC, the leading provider of Colorado forklift certification training, offers 100% OSHA-approved forklift operator training that’s fast, convenient and affordable. All training materials are available online around the clock, which means the training can be completed using a digital device any time and anywhere there’s an internet connection. FLC’s Colorado Forklift certification can be completed in as little as an hour, but since there’s no time limit, employees can complete the coursework whenever and wherever it’s convenient. OSHA requires forklift operators to be recertified every three years or whenever they’re involved in an accident or near miss while operating a forklift. When you choose FLC’s Colorado forklift certification for your employees, refresher training is free for life. If you or your employees relocate, your forklift certification Colorado goes with you. FLC’s forklift operator certification is valid everywhere in the state, including Denver, Greeley, Aurora, Colorado Springs, Boulder and Fort Collins. It’s also valid throughout the entire country! FLC is the ideal Colorado forklift training solution for employers and employees alike. With FLC’s affordable Colorado forklift certification training, you’ll be fully OSHA compliant, and will enjoy free lifetime support, which are among the reasons why we’re the forklift training provider of choice for businesses of all sizes throughout the state of Colorado. 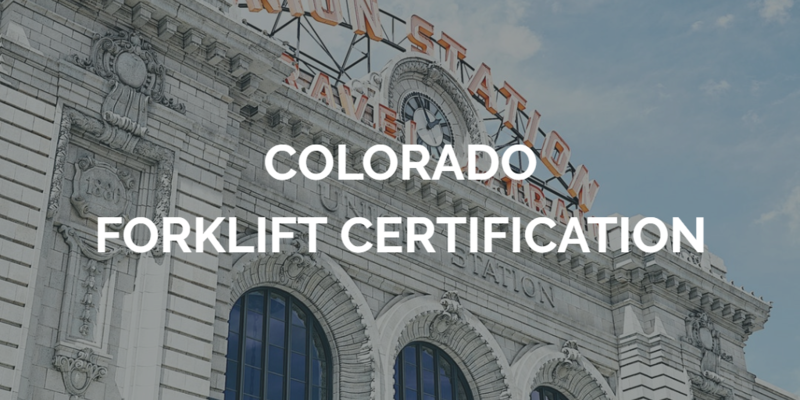 Employers throughout the Rocky Mountain State rely on FLC for all their Colorado forklift certification and training needs. Through our three budget-friendly training program choices, we’ll help your entire forklift operator team to become OSHA compliant in no time at all. Training Kit– If you or your employees need forklift certification in Colorado, there’s no need to look further than com. This common sense Forklift Operator Training Kit with an emphasis on workplace safety includes everything your workers need to know about how to properly operate forklifts is priced at just $299. Train a Trainer– This value-added course trains any designated employee or employees to become Certified Forklift Safety Experts. Our Tran a Trainer Program allows employers set up their own in-house, OSHA-approved training program to certify newly hired forklift operators for just $149. Bundle Package– FLC’s Bundle Package includes both the Training Kit and Train a Trainer course at the discounted price of just $399, which is a savings of $50 over purchasing the courses separately. Still have questions or need more information about FLC’s Colorado Forklift Certification Training? Get in touch with us online or call us at 888-278-8896. Thanks for taking the time to visit ForkliftCertification.com. We’re here to help you with all your Colorado forklift operator training needs.